In 1977, the church designated an area of their grounds as “green area for recreation, especially for children.” Today, the space remains in its natural state as a woods and a Nature Explore Classroom. 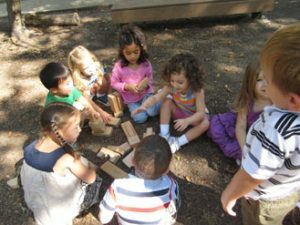 In 2006 St. Andrew’s Presbyterian Children’s Place Preschool looked to their friends and family as well as the greater Houston community, to help preserve the “Little Woods in a Big City”. Aided by Urban Naturalists from the Texas Parks and Wildlife Department and the Texas Forestry Service, the Children’s Place identified areas for improvement within the one-third acre Woods with the outcome to be a strengthened ecology with an emphasis on native plants, and on preservation of the Woods’ ‘wildness’. Cara Pauloski, parent, Campaign Chair, and grant writer skillfully led the way including a plan for an annual fund raiser. The Butterfly entrance gate to the Woods was designed by our Fine Arts Teacher, Terry Flores. The same design was made into sterling silver jewelry and is sold annually to contribute to the landscape fund. A Keep Houston Beautiful grant and parent funded a Wildlife Fountain surrounded by native plants was installed and benches and bricks were sold with the donor names. Elizabeth Singleton and Mark Coady replaced the chain link fence with a secure wrought iron fence with columns that match the Church’s brick to aesthetically connect the Woods with the Church across the street. One of the goals of the Woods Campaign was to provide professional development for educators in the Woods. In 2011, national Nature Explore Trainers gave three days of training to over 100 teachers from dozens of schools in the region. Six of our Children’s Place teachers have received Nature Explore Training. The children spontaneously formed a game of dividing up a bucket of blocks brought from the indoors. The Nature Education curriculum supports the hands-on experience of guided and free play in the Woods. Through child and teacher-initiated activities it serves as a model for outdoor environmental care. What can be done indoors can most likely be done outdoors, so often designated outdoor times are extended. The Gathering area is used for Circle Time and acting out dictated stories by children with spontaneous child-directed expressions in song and dance. 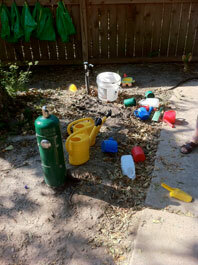 The cement art table and large sandbox is located near the water spigot to create texture and well, a mess! 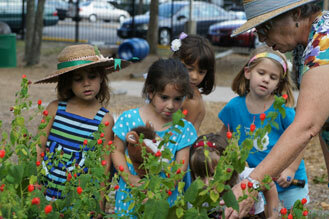 Gardening is located in several areas for various age groups. Toddlers tend to an herb garden and the threes and fours vegetable beds, but everyone keeps a watchful eye on the butterflies which benefit from three native plant habitats. When not chasing butterflies the children ride trikes, tote wood, rocks, pumpkins and each other in wheelbarrows. As an indication of the importance of reconnecting children to nature, the Children’s Place has an Outdoor Coordinator on staff to directly interact with children twice a week in age group rotations from two to four years of age. Indirect time includes development projects and maintenance of the Woods as well as coordinating service projects with Boy Scouts. One of the most important aspects of an outdoor classroom is convenient and plentiful storage. There are hooks on fences for smocks and watering cans, closets under structures for blocks, and shelving serves as nature nooks for found natural objects are continuously added as the need arises. Parents attend workdays and special events. The annual Sparkle workday attracts gardeners, woodworkers, grandparents and children who want to use their skills to make fun improvements. They return for more fun at the St. Andrew’s Children’s Place Annual Picnic with live music, Ride a Thon trike fund raiser, Art Car Parade viewing area as well as pre-k graduations. The Woods is also a popular photo opportunity as the cottage garden is decorated for holidays. The Woods is reserved during the school day but open for neighborhood and after school enjoyment all other times. It is often used by parents and children for playdates. The cement tree bench with a bird bath in the center hole will hold up as an Art Table in the Houston humidity. Keep Houston Beautiful awarded a grant for the wildlife! One of the most important features of an Outdoor Classroom is convenient storage. Hooks for self-serve smocks and watering cans are available.